At the Prefectural Government on July 26, Konishiki Yasokichi (on the right in the front row) shows his certificate as cultural ambassador for Uchina. Okinawa Prefecture has accredited 47 year-old Hawaiian-born Japanese–Samoan former sumo wrestler Konishiki Yasokichi as the 219th cultural ambassador for Uchina (Okinawa). 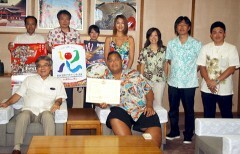 Certification as cultural ambassador for Uchina is granted to people who promote the charms of Okinawa overseas. Vice-governor Yoshiyuki Uehara handed the certificate to Konishiki at the Prefectural Government offices. Before he retired, Konishiki reached ozeki, the second highest rank in professional sumo divisions. His first visit to Okinawa was in 1982 as a tsukibito, an attendant of a higher ranked sumo wrestler, but he said that these days he comes to Okinawa several times a year. Konishiki was born in Hawaii in 1963. After graduating from high school, he joined the Takasago stable and began his sumo career in 1982. He was promoted to the rank of ozeki before eventually retiring in 1997. Konishiki currently appears in Hawaiian music concerts and events as a celebrity.